A.1 Inal A, Ocak OB, Aygit ED, Yilmaz I, Inal B, Taskapili M, Gokyigit B. Comparison of visual acuity measurements via three different methods in preschool children: Lea symbols, crowded Lea symbols, Snellen E chart. Int Ophthalmol. 2017 Jun 20. doi: 10.1007/s10792-017-0596-1. A.2 Yilmaz I, Ocak OB, Yilmaz SB, Inal A, Gokyigit B, Taskapili M. Comparison of quantitative measurement of foveal avascular zone and macular vessel density in eyes of children with amblyopia and healthy controls: An optical coherence tomography angiography study. Journal of American Association for Pediatric Ophthalmology and Strabismus (J AAPOS) 2017. A.4 Yilmaz I, Perente I, Kesim C, Saracoglu B, Yazici AT, Taskapili M. Ocular Pulse Amplitude and Retinal Vessel Caliber Changes after Intravitreal Dexamethasone Implant. Middle East African Journal of Ophthalmology 2016;23(3):250-2. 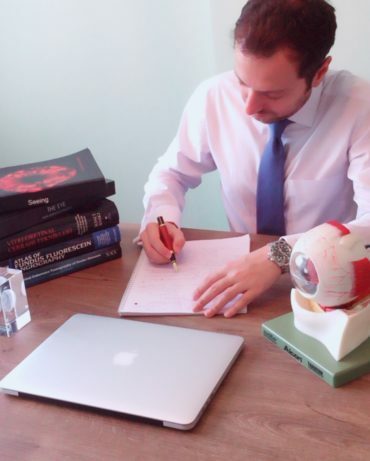 A.5 Yilmaz I, Perente I, Saracoglu B, Yazici AT, Taskapili M. Changes in pupil size following panretinal retinal photocoagulation: conventional laser vs pattern scan laser (PASCAL). Eye (Lond.) 2016;30(10):1359-64. A.6 Agca A, Olcucu O, Yıldırım Y, Perente I, Yılmaz I, Fazıl K, Yasa D, Demircan A, Demirok A. Evaluation of visual results of hydrophilic diff ractive-refractive multifocal intraocular lenses. J Emmetropia 2016; 3: 127-132. A.7 Yilmaz T, Karci AA, Yilmaz I, Yılmaz A, Yıldırım Y, Sakalar YB. Long-Term Changes in Subfoveal Choroidal Thickness After Cataract Surgery. Med Sci Monit. 2016 May 9;22:1566-70. A.8 Yilmaz I, Ozcelik F, Basarir B, Demir G, Durusoy G, Taskapili M. Clinical Performance of Toris K Contact Lens in Patients with Moderate to Advanced Keratoconus: A Real Life Retrospective Analysis. J Ophthalmol. 2016;2016:2358901. doi: 10.1155/2016/2358901. A.9 Ozkaya A, Alagoz C, Alagoz N, Gunes H, Yilmaz I, Perente I, Yazici AT, Taskapili M. Dexamethasone implant in pseudophakic and nonglaucomatous subgroup of diabetic macular edema patients: a real life experience. Eur J Ophthalmol. 2016 Jun 10;26(4):351-5. doi: 10.5301/ejo.5000725. A.10 Yilmaz I, Faiz M, Saracoglu B, Yazici AT. Changes in Pupil Size Following Panretinal and Focal/Grid Retinal Photocoagulation: Automatic Infrared Pupillometry Study. J Ocul Pharmacol Ther. 2016 Apr;32(3):172-7. A.11 Alagoz N, Alagoz C, Yilmaz I, Yıldırım Y, Baz O, Altan C, Yazıcı AT, Taskapılı M. Immediate Intraocular Pressure Changes Following Intravitreal Dexamethasone Implant. J Ocul Pharmacol Ther. 2016 Jan-Feb;32(1):44-9. A.12 Yasa D, Agca A, Alkin Z, Cankaya KI, Karakucuk Y, Cosar G, Yilmaz I, Yildirim Y, Demirok A. Two-Year Follow-Up of Artisan Iris-Supported Phakic Anterior Chamber Intraocular Lens for Correction of High Myopia. Seminars in Ophthalmology 2016;31(3):280-4. A.13 Alkın Z, Yılmaz I, Ozkaya A, Yazıcı AT (2016). Anti-vascular endothelial growth factor treatment for proliferative macular telangiectasia type 2. Middle East African Journal of Ophthalmology 2016;23(2):222. A.14 Abdullah O, Yılmaz I, Alkın Z, Karakucuk Y, Yazıcı AT (2016). Intravitreal ranibizumab in the treatment of choroidal eovascularization secondary to morning glory syndrome in a child. Saudi journal of ophthalmology 2016;30:140-3. A.15 Agca A, Cankaya KI, Yilmaz I, Yildirim Y, Yasa D, Olcucu O, Demircan A, Demirok A, Yilmaz OF. Fellow Eye Comparison of Nerve Fiber Regeneration After SMILE and Femtosecond Laser-assisted LASIK: A Confocal Microscopy Study. J Refract Surg. 2015 Sep;31(9):594-8. A.16 Ozkaya A, Alkin Z, Yilmaz I, Yazici AT. Comparison of intravitreal ranibizumab between phakic and pseudophakic neovascular age-related macular degeneration patients: Two-year results. Saudi J Ophthalmol. 2015 Jul-Sep;29(3):182-6. A.17 Yilmaz I, Ozkaya A, Alkin Z, Ozbengi S, Yazici AT, Demirok A. Comparison of the Plusoptix A09 and Retinomax K-Plus 3 With Retinoscopy in Children. Journal of Pediatric Ophthalmology & Strabismus (JPOS) 2015;52(1):37-42. A.18 Yilmaz I, Ozkaya A, Kocamaz M, Ahmet S, Ozkaya HM, Yasa D, Agca A, Yazici AT, Demirok A. Correlation of Choroidal Thickness and Body Mass Index. Retina 2015 Oct;35(10):2085-90. A.19 Ozgurhan EB, Kara N, Cankaya KI, Akcay BIS, Kurt T, Yilmaz I, Demirok A. Corneal Wavefront Aberrations After Primary and Recurrent Pterygium Surgery. Eye & Contact Lens 2015 Nov;41(6):378-81. A.20 Aygit ED, Yilmaz I, Ozkaya A, Alkin Z, Gokyigit B, Yazici AT, Demirok A. Choroidal thickness of children's eyes with anisometropic and strabismic amblyopia. Journal of American Association for Pediatric Ophthalmology and Strabismus (J AAPOS) 2015 Jun;19(3):237-41. A.21 Alkın Z, Yılmaz I, Özkaya A, Yazıcı AT (2015). Steroid-induced central serous chorioretinopathy in a patient with non-arteritic anterior ischemic optic neuropathy. Saudi Journal of Ophthalmology 2015;29(3):232-4. A.22 Yilmaz I, Yazici AT, Demirok A, Yilmaz OF. The Results of Intravitreal Bevacizumab Injections and Laser Photocoagulation for the Treatment of Macular Edema Secondary to Retinal Vein Occlusion. British Journal of Medicine and Medical Research 2015;5(6):831-5., Doi: 10.9734/BJMMR/2015/13100. A.23 Yilmaz I, Alkin Z, Ozkaya A, Yazici AT. Comparison of Choroidal Thickness in Normal Subjects and Patients with Diabetes. Advances in Research 2015;3(1):102-6. A.24 Agca A, Demirok A, Celik HU, van de Pol C, Cankaya KI, Celik NB, Yasa D, Yilmaz I, Yilmaz OF. Corneal Hysteresis, Corneal Resistance Factor, and Intraocular Pressure Measurements in Eyes Implanted With a Small Aperture Corneal Inlay. Journal of Refractive Surgery 2014;30(12):831-6. A.25 Yilmaz I, Altan C, Aygit ED, Alagoz C, Baz O, Ahmet S, Urvasizoglu S, Yasa D, Demirok A. Comparison of three methods of tonometry in normal subjects: Goldmann applanation tonometer, non-contact airpuff tonometer, and Tono-Pen XL. Clinical Ophthalmology 2014 Jun 7;8:1069-74. A.28 Ozkaya A, Yilmaz I, Alkin Z, Karakucuk Y, Yazici AT. The Effect of Required Injection Numbers during the First Year on the Clinical Course of Neovascular Age-related Macular Degeneration. Ophthalmology Research: An International Journal 2014;2(6):397-405., Doi: 10.9734/OR/2014/11667. A.29 Yilmaz I, Ozkaya A, Karatas G, Yazici AT. Retinal Nerve Fiber Layer Thickness Measurements via SD-OCT in Pediatric Patients. Unique Journal of Medical and Dental Sciences 2014;2(3):98-100. A.30 Thompson V, Yilmaz I. Phakic Intraocular Lenses (Review). Contemporary Ophthalmology 2008;7:1-8. B1. Ocak OB, Gokyigit B, Inal A, Aygit ED, Ocak SY, Yilmaz I. Clinical spectrum of high myopic strabismus in pediatric age. 37th meeting of the european strabismological association. B.2 Aygit ED, Yilmaz I, Erdur SK, Alkin Z, Ozkaya A. The value of pattern electroretinography, short-wavelenght automated perimetry and color vision tests in diagnosis of glaucoma. 33. Congress of the ESCRS. B.3 Yilmaz I, Ozkaya A, Perente I, Yazici AT. Choroidal Thickness and Body Mass Index. ASRS 2015. B.4 Ozkaya A, Yilmaz I, Alkin Z, Perente I, Yazici AT. Photoreceptor Outer Segment Layer Thickness In Healthy Volunteers Via Spectral Domain Optical Coherence Tomography. ASRS 2015. B.5 Alkin Z, Ozkaya A, Yilmaz I, Karakucuk Y, Yazici AT. Prognostic Factors Relevant for Visual Acuity in Chronic Central Serous Chorioretinopathy. 14th ESASO Retina Academy, 232(s2), 1-98., Doi: 10.1159/000368726. B.6 Yilmaz I, Ozkaya A, Yazici AT. Macular Thickness Measurements in Healthy Turkish Subjects via Optical Coherence Tomography: Changes with Age and Gender. 14th ESASO Retina Academy, 232(s2), 1-98., Doi: 10.1159/000368726. B.7 Alagoz C, Gunes H, Baz O, Yuksel K, Yilmaz I, Yazici AT, Demirok A. Intravitreal Dexamethasone Implant for Persistent Diabetic Macular Edema. 14th ESASO Retina Academy, 232(s2), 1-98., Doi: 10.1159/000368726. B.8 Ozkaya A, Yilmaz I, Yalcın K, Alkin Z, Yazici AT. Intravitreal Ranibizumab in the Treatment of Peripapillary Choroidal Neovascularization Secondary to Morning Glory Syndrome in a Child. 14th ESASO Retina Academy, 232(s2), 1-98., Doi: 10.1159/000368726. B.9 Yilmaz I, Ozkaya A, Alkin Z, Perente I, Alagoz C, Yazici AT. Macular Thickness Measurement via Heidelberg Spectralis SD-OCT in Pediatric Patients. 14th ESASO Retina Academy, 232(s2), 1-98., Doi: 10.1159/000368726. B.10 Doukas D, Yilmaz I, Perente I, Patsiamandi M, Panagiotis N, Magda T, Kyratzoglou K, Ioannakis K. The Use of Subthreshold Diode Micropulse Laser 532 nm (SDM) in the Treatment of Diabetic Macular Edema. 14th ESASO Retina Academy, 232(s2), 1-98., Doi: 10.1159/000368726. B.11 Ozkaya A, Alkin Z, Yilmaz I, Yalcin K, Alagoz C, Yazici AT. The Effect of Number of Injections During the First Year on the Clinical Course of Neovascular Age-Related Macular Degeneration. 14th ESASO Retina Academy, 232(s2), 1-98., Doi: 10.1159/000368726. B.12 Perente I, Yilmaz I, Ozkaya A, Yazici AT. Early Effect of Ranibizumab on Choroidal Thickness in Diabetic Macular Edema. 15th EURETINA Congress. B.13 Yilmaz I, Yuksel K, Alkin Z, Yazici AT. Intravitreal dexamethasone implant for macular edema secondary to branch retinal vein occlusion: 6 month results. 15th EURETINA Congress. B.14 Yuksel K, Ozkaya A, Alagoz C, Baz O, Yilmaz I, Yazici AT. Evaluation of the effect of internal limitan membrane peeling surgery on functional and anatomical success for diabetic epiretinal membrane cases. 15th EURETINA Congress. B.15 Ozcelik F, Yilmaz I, Saracoglu B, Taskapili M. Comparison of visual results of RPG contact lenses in keratoconus subgroups: Cone type, cone location, and severity of the disease. 46th ECLSO. B.16 Altan C, Basarir B, Satana B, Ozcelik F, Yilmaz I, Taskapili M. Minimally invasive supraciliary microstent for IOP control in combined POAG-cataract surgery: 2-year COMPASS RCT results. 34th Congress of the ESCRS. C1. Atlas of Fundus Fluorescein Angiography, Bölüm adı:(52-53-54. Bölüm) (2016). Perente I, Altan T, Yazici AT, Ozkaya A, Yilmaz I. Atlas Kitapçılık, Editör: Lawrence A Yanuzzi, Basım sayısı:2, Sayfa Sayısı:606, ISBN:9350909782, İngilizce (Kitap Tercümesi). D1. Baz Ö, Yılmaz İ, Alagöz C, Demircan A, Perente İ, Özkaya A, Taşkapılı M. Efficacy of Intravitreal Bevacizumab in Treatment of Proliferative Type 2 Idiopathic Juxtafoveal Telangiectasia. Turk J Ophthalmol. 2017 Jun;47(3):144-148. D2. Yılmaz İ, Aygıt ED, Erdur SK, Demirok A. Results of subconjunctival 5-fluorouracil in the management of bleb failure: A case series. Ege Tıp Dergisi 2015;54(3):111-3., Doi: 1016-9113. D.3 Aygit ED, Alkın Z, Yılmaz İ, Erdur SK, Alimgil ML. Kısa Dalga Boylu Görme Alanının Glokom Tanısındaki Önemi. Glokom-Katarakt Dergisi 2015;10(1):19-22. D.4 Özbaş M, Yılmaz İ, Aygıt ED, Alkın Z, Özkaya A. Primer Açık Açılı Glokom Hastalarında Dorzolamid/Timolol Maleat ve Brinzolamid/Timolol Maleat Sabit Kombinasyonlarının Karşılaştırılması. Glokom-Katarakt Dergisi 2015;10(1):28-32. D.5 Yılmaz İ, Mutaf Ç, Satıcı T, Özçelik F, Yazıcı AT, Demirok A. Sağlıklı gözlerde optik koherens tomografi ile maküler kalınlık ölçümü: Yaş ve cinsiyete bağlı değişimler. Ege Tıp Dergisi 2015;54(1):15-18. D.6 Yılmaz İ, Özkaya A, Alkın Z, Özçelik F, Yazıcı AT. Yaş Tip Yaşa Bağlı Maküla Dejenerasyonu Hastalarında Intravitreal Bevacizumab Tedavisinin Sonuçları. Yeni Tıp Dergisi 2015;32(2):90-2. D.7 Basçı A, Yılmaz I, Ozkaya A, Yazıcı AT, Demirok A (2015). Bilateral Optik Disk Hipoplazisi. MN Oftalmoloji 2015;22(3):200-1. D.8 Mutaf Ç, Yılmaz I, Bozkurt E, Demirok A (2015). Iris Kistli Olan Hastada Nd: YAG Lazer Kistotomi ile Tedavi. MN Oftalmoloji 2015;22(4):256-8. D.9 Özbaş M, Erol MK, Yılmaz İ, Yavuz L, Akbaba M (2014). Travma Sonrası Lens Partikül Glokomu Gelisimi: Olgu Sunumu. The Journal of Kartal Training and Research Hospital 2014;25(1):65-8. D.10 Yılmaz İ, Özkaya A, Çavdar E, Alkın Z, Aygıt ED, Fazıl K. Vitreus Kanamas Olan Hastalarda Vitrektomi Öncesi Flaş ERG ve Flaş VEP’in Cerrahi Sonrası Görme Keskinliği ile ilişkisi. Yeni Tıp Dergisi 2014;31(3):186-8. D.11 Yılmaz İ, Özbaş M, Aygıt ED. Glokomda Görme Alan Değişimleri: 4 Yıllık Perimetri İzlemi. Glokom-Katarakt Dergisi 2014;9(4):270-2. D.12 Yılmaz İ, Özkaya A, Yeşilbakan T, Alkın Z. Oküler Yüzey Bozukluklarının Tedavisinde Amniyon Membran Transplantasyonunun Kısa Dönem Sonuçları. Yeni Tıp Dergisi 2014;31(4):238-40. D.13 Yılmaz İ, Yavuz L. Katarakt Hastalarında Monofokal ve Akomodatif Göz İçi Lensi Kullanımının Karşılaştırılması. Yeni Tıp Dergisi 2013;30(2):93-6. D.14 Yavuz L, Yılmaz İ, Özgür ÖR, Kandemir B, Çallı Ü, Cabi C. Toris K Silicone Hydrogel Contact Lens for the Optical Management of Keratoconus. Yeni Tıp Dergisi 2013;30(3):174-6. D.15 Yavuz L, Kuğu S, Yılmaz İ, Öztürk Y, Özertürk Y. Diyabetik ve Diyabetik Olmayan Hastalarda Fakoemülsifikasyon Cerrahisi Sonuçlar. The Journal of Kartal Training and Research Hospital 2013;24(2):103-6. D.16 Özbaş M, Kuğu S, Yılmaz İ, Erdoğan G, Erol MK, Kandemir B. Psödoeksfoliasyon sendromlu gözlerin heidelberg retinal tomografi ile değerlendirilmesi. Bakirkoy Tip Dergisi / Medical Journal of Bakirkoy 2013;9(3):126-30. D.17 Yılmaz İ, Özbaş M, Yavuz L. Akomodatif WIOL-CF göz içi lensinin erken dönem sonuçları. MN Oftalmoloji 2013;20(2):93-7. D.18 Yılmaz İ. Primer açık açılı glokom olgularında brinzolamid-timolol maleat sabit kombinasyonunun etkinliğinin değerlendirilmesi. MN Oftalmoloji 2013;20(1):20-3. D.19 Yılmaz İ, Daştan M. Telescopic Spectacles for Visual Rehabilitation of Patients with AMD and Macular Dystrophy. Yeni Tıp Dergisi 2013;30(1):46-9. D.20 Yılmaz İ, Akdemir BB, Yavuz L. Sağlıklı bireylerde Goldmann aplanasyon tonometrisi ve tonopen ölçümlerinin karşılaştırılması ve merkezi kornea kalınlığının ölçüme etkisi. MN Oftalmoloji 2012;19(3):167-70. D.21 Yılmaz İ, Yavuz L. İleri evre keratokonus hastalarının görsel rehabilitasyonu için silikon hidrojel yumuşak kontakt lens kullanımı. Şişli Etfal Hastanesi Tıp Bülteni 2012;46(4):199-202. D.22 Ateş ZC, Akçay L, Özkurt YB, Yılmaz İ, Doğan ÖK. Yüksek miyopili gözlerde refraktif göz içi lens cerrahisi sonuçlarımız. Türk Oftalmoloji Gazetesi 2006;36(1):39-43. D.23 Yılmaz İ, Özçelik F, Demir G, Karataş G, Saraçoğlu B, Taşkapılı M. Comparison of visual results of RGP contact lenses in keratoconus subgroups: Cone type, cone location, severity of the disease. Ege Tıp Dergisi 2017;56(1):29-33. D.24 Yılmaz İ, Saraçoğlu B, Ahmet S, Baz Ö, Özkaya A, Taşkapılı M. Tek Dekzametazon Implant Enjeksiyonu Sonrası Göz İçi Basıncı Değişiklikleri: Gerçek Hayat Klinik Çalışması, 110 Vaka Serisi. Ret-Vit 2017;26:99-104. D.25 Baz Ö, Yılmaz İ, Alagöz C, Yazıcı AT, Özkaya A, Taşkapılı M. Kronik Santral Seröz Koryoretinopati Tedavisinde Eşik Altı Mikropulse Sarı Lazerin (577 nm) Kısa Dönem Etkinliği. Ret-Vit 2017;26:133-137. D.26 Baz Ö, Yilmaz İ, Alagöz C, Demircan A, Perente İ, Özkaya A, Taşkapılı M. Proliferatif Tip 2 İdiyopatik Jukstafoveal Telenjiektazi Tedavisinde İntravitreal Bevacizumabın Etkinliği. Turk J Ophthalmol. 2017 Jun;47(3):144-148. doi: 10.4274/tjo.04874. PMID: 28630789. D.28 Ocak OB, Inal A, Aygit ED, Yilmaz I, Demirok A, Gokyigit B. Posterior Scleritis after Extraocular Horizontal Muscle Transposition Surgery: A Case Report. Beyoglu Eye J 2017;2(2):71-74. DOI:10.14744/bej.2017.43531.